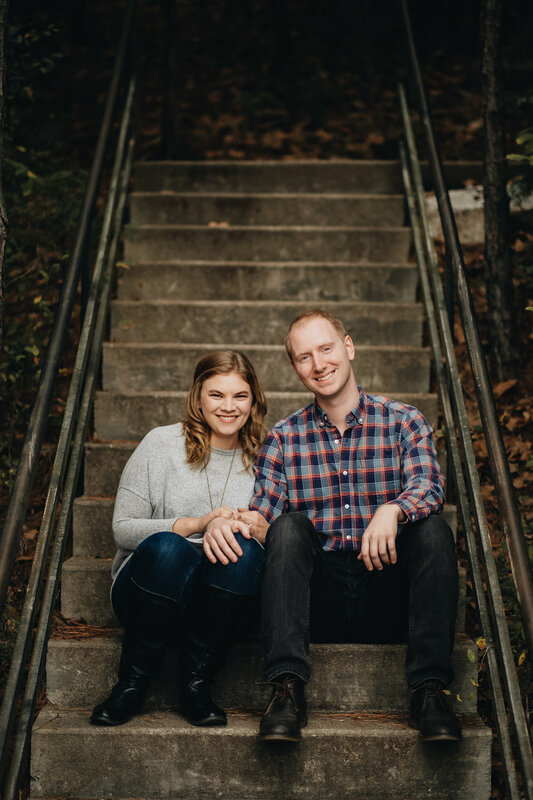 Initially meeting in 2015 on a work project, Stacia and Michael worked for the same Kansas City company. Even with crazy travel schedules, they somehow found a way to make the distance work. Later that year, they both exchanged “I love yous” and Stacia told Michael’s best friend (and now best man) that she was going to marry him. Currently, the two live in South Bend, Ind. where Stacia attends graduate school at Notre Dame and Michael works remotely. Originally from Northwest Arkansas and Iowa, the two had some big decisions to make when choosing a city and venue for their summer wedding. Why Fayetteville for the wedding? We originally considered Kansas City where we were both living, however, once we moved to Indiana, we decided that we'd go with tradition and get married in the bride's hometown. What were you looking for in a wedding venue? Have-to-haves or no-gos! MUST have - Air Conditioning. No barns. No burlap. No Mason jars. What were your initial thoughts when looking at Walton Arts Center (WAC)? WOW, this is amazing. How will it ever fit in our budget? (Spoiler alert - it was competitive with other venues in the area and did in-fact fit in the budget). What were you surprised about when touring WAC? How willing Shannon and Justin were to use the space in creative ways. What made you say “yes” to a WAC wedding? The staircase leading to the Walker Atrium. I KNEW I wanted to enter the reception from there the moment I saw it. What are you most excited about in planning your WAC wedding; Any fun things that you’re planning to do? We are most excited to see it all come together. Right now it's abstract, on Pinterest boards and ideas in our head. I can't wait to see it come together on the big day. 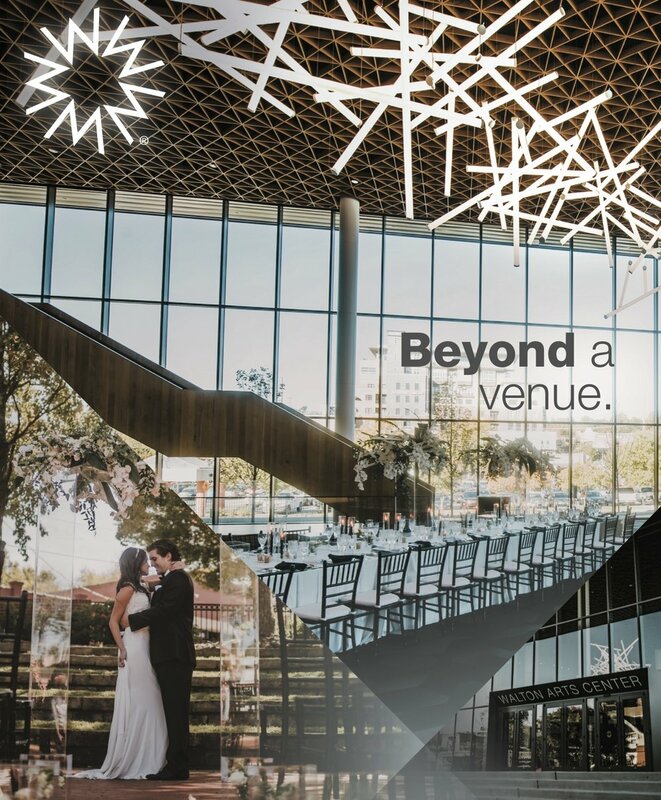 We have tons of space to work with (Bradberry Amphitheater/Rose Garden, Sudduth Garden Room, Walker Atrium and Pace Lobby Balcony), and I'm excited to get to bring unique elements to each of them. We are planning on putting our dance floor on the balcony with the DJ. We want people to be able to dance and have fun, but also have the option to socialize with other guests. People who want to socialize can stay in the atrium without feeling like they are too far from the party. What does it mean to celebrate one of the biggest days of your life at WAC? Growing up in the Fayetteville area, I remember going to shows at WAC as a kid with hundreds of other students in Northwest Arkansas on field trips. I took art classes at Nadium Baum Center, and I remember attending other shows (Legally Blonde) as I got older. I remember finding out they were renovating after I moved away. WAC is in the heart of Fayetteville, and I'm excited to get to show people (some of whom have never visited Arkansas) why I love this place. When I brought Michael to Arkansas, he finally understood why I loved it so much, and now, we get to share this fun and unique town with our friends. Describe your experience working with wAC’s Event planners. Shannon and Justin are full of ideas. I knew that I would be planning my wedding while in grad school multiple states away, and that I would need a reception with staff who knew how to handle events - and they have delivered. Justin has worked tirelessly to go through countless versions of seating arrangements to get it just right for our big day. They are able to suggest ideas or let us know what they have seen or done before, and it's helpful to know that they've got this handled. Additionally, they were always receptive to new ideas or never-before attempted layouts. The flexibility they have shown by not being beholden to one set routine way of doing things has made for a wonderfully unique experience. If we wanted to have long tables instead of only rounds they were thrilled to try and make that layout work. Their knowledge of the space is on display when we discussed wanting to have decorations in specific areas, or needed to identify where to put speakers. Their combined experience and willingness to try new ideas has been extremely impressive. Shades of blue: navy, steel blue and light blue with touches of champagne and blush. Describe your style. Traditional, trendy, modern, eclectic, etc. How are you adding personal touches to your wedding? We have geese cake toppers. Michael's friends all call him "Goose" because of his last name, and I found a goose-shaped bride and groom cake topper that I knew would be perfect.